April 6, 2016. Mark this date. Something happened today that will affect hundreds of women in Clarksville, Tennessee. Gateway got balls! Six of them, to be exact. Red, yellow, pink, green, silver and blue. If you’ve been following my Gofundme campaign, you know exactly what I’m talking about. For the rest of you, let me catch you up. I’ve been at a loss as to how to influence change there beyond educating pregnant women about their birth options and rights (which generally lead to them leaving to seek care at other places like NorthCrest or Vanderbilt). The reality is that the majority of the women giving birth at Gateway end up getting epidurals, whether they truly want them or simply find themselves with no other pain management options. And many of those women end up with c-sections because their babies get “stuck” or labor “fails to progress”. Better positioning of mom during labor can often resolve both of those issues. Enter the peanut ball. 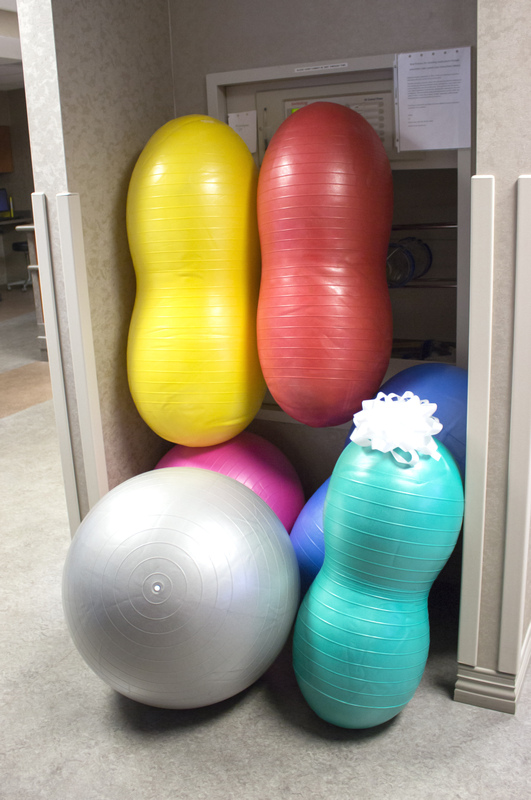 Basically, it’s an exercise ball shaped like a peanut. 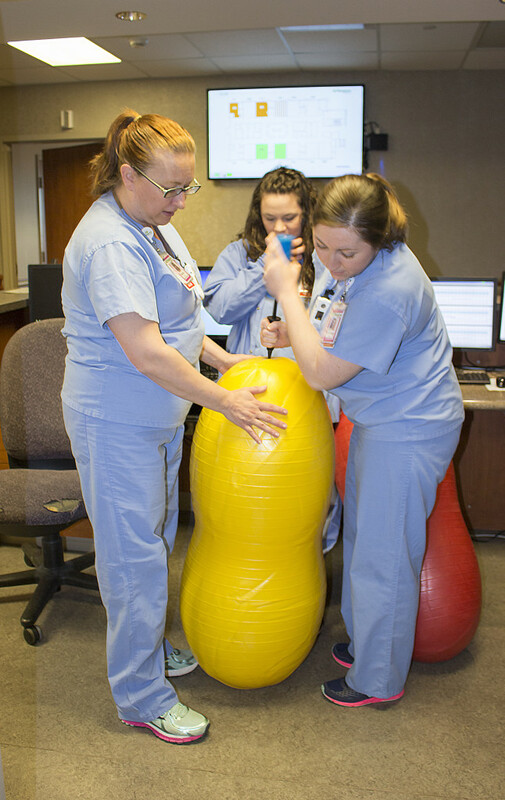 Nothing fancy about it, but when used to help position women during labor – especially those who are numb with an epidural – the peanut ball has been shown to both shorten labor and reduce the c-section rate. I figured that introducing the concept of using peanut balls would be a simple way to help improve birth outcomes for Clarksville women. It’s not a radical concept. Sounds easy enough to me. We’ll see! I have reason to hope. There’s been a leadership change at Gateway, which has nothing to do with the hospital joining the Tennova network and everything to do with this donation being well-received. Learning about the new Director of Women’s and Children’s Services (aka Labor & Delivery) encouraged me that birth options at Gateway Tennova Healthcare – Clarksville could change along with the name. Even if it’s only exchanging pillows for peanut balls, it would be an improvement. Which brings me back to the fundraiser. 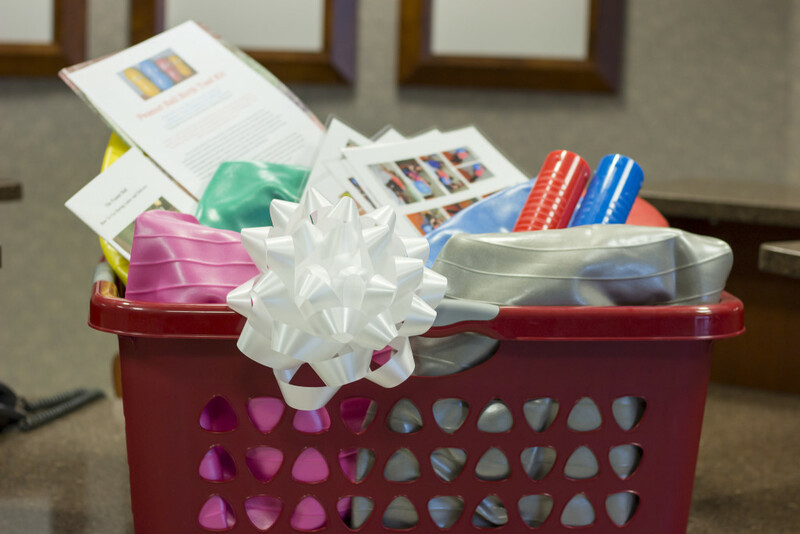 My goal was to raise enough money to buy a complete set of peanut balls (four sizes), round ball (two sizes), handheld pumps, and the educational material to go along with them (laminated pages showing photos of positions, Powerpoint presentation on CD and an instructional booklet). With the help of only a couple dozen contributors – 22 to be exact – we met and exceeded my original target of $350 and ultimately raised $520! That enabled me to also buy ten Intro Kits (CD & laminated peanut ball sheet) to educate other hospitals. While the fundraiser was going on, fellow doula Tiffany Dixon and I worked to plan a meeting with the new director, Sandy Smith, and some of her staff. That came together beautifully a couple of weeks ago when a small group of us gathered to hear Sandy’s goals and to share where we are coming from as doulas. Honestly, I went into that meeting still skeptical about whether I should even give the peanut ball kit to Gateway at all. I needed to be confident that the tools would be used and not end up collecting dust in a closet. I didn’t even plan to tell them about it at this meeting. I could just as easily give the kit to NorthCrest instead, where I have no doubt they’d be welcomed. As that meeting unfolded, I heard what I needed to hear. I could see that the peanut ball kit would be enthusiastically welcomed by not only Sandy, but by the nursing staff as well. And that’s exactly what happened today. Fellow doula Sherly Lopez and I met with Sandy Smith and Amy White (Manager of Women’s and Children’s Services) to formally present the donated kit. 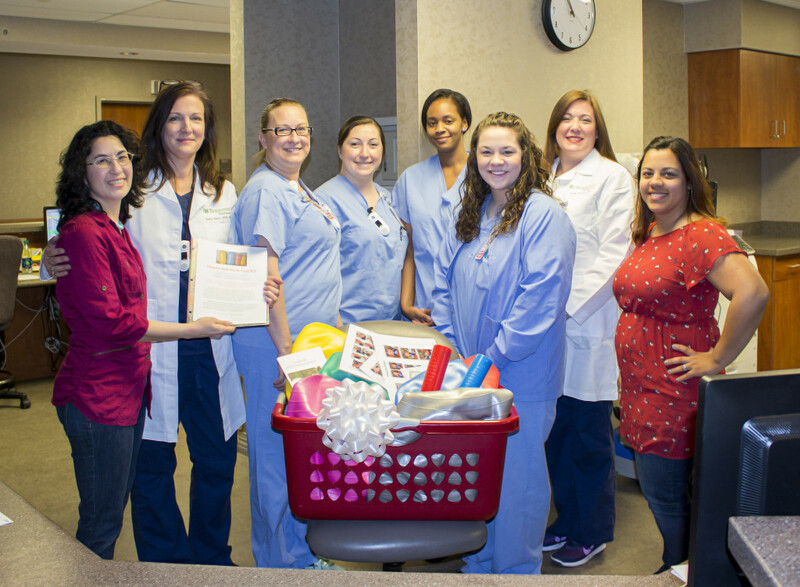 I expected it to be a simple handover, but we were brought back to the Labor & Delivery nurses’ station, where they gathered around to see our big red basket of colorful goodies. 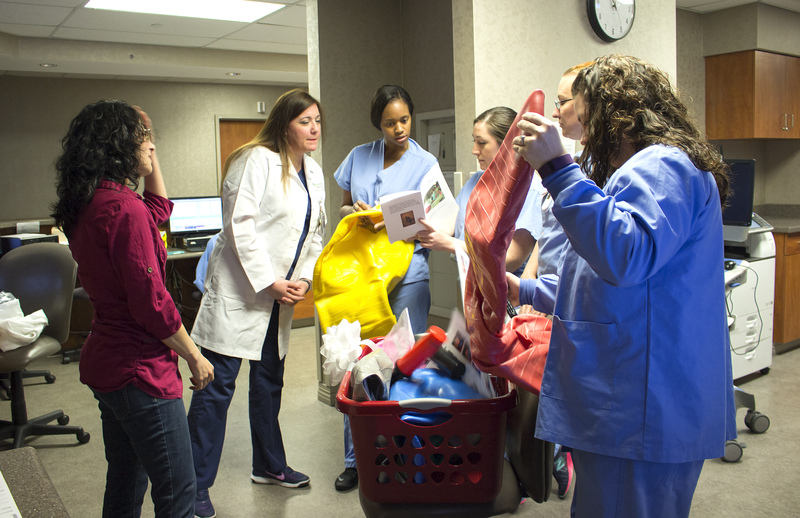 Within minutes, they were inflating the balls and even toting them off down the hallway to use with their actively laboring patients. I couldn’t have hoped for a better reception. How will this affect Clarksville moms? 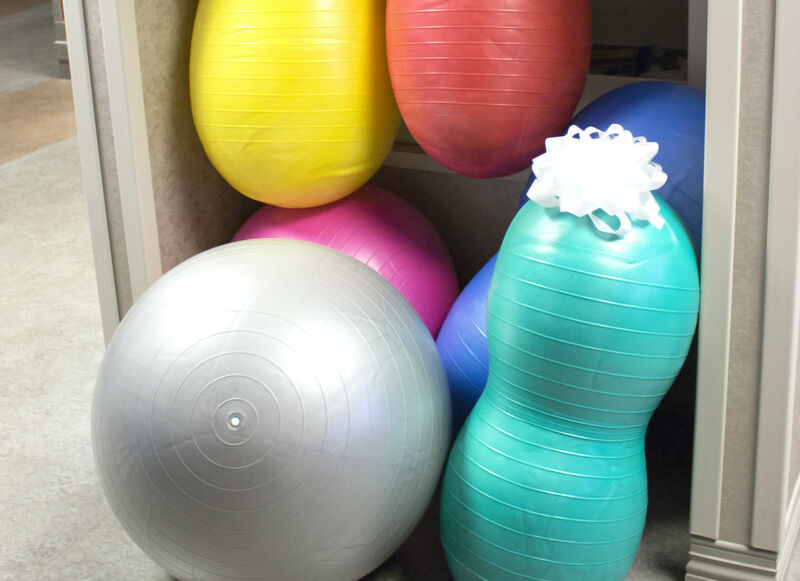 Now every woman giving birth at Gateway / Tennova has access to both peanut balls and round exercise balls. Whether you’ve taken a childbirth class or not, hired a doula or not, plan on a natural birth or not, you can use these tools. Ask your nurse for them. Clarksville moms also have another tool available to them: an experienced doula. Effective today, I am now once again taking clients planning births at Gateway Tennova Healthcare – Clarksville. It’s been an exciting year so far! I’m looking forward to seeing what happens in the months to come. Maybe I’ll see you at Gateway! 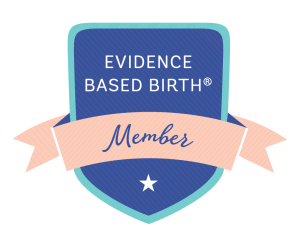 Posted in Clarksville and tagged birth doula, birth options, c-section, cesarean, Clarksville, epidural, Gateway, hospital birth, peanut ball, Tennova Healthcare. This is wonderful now if we can do something to improve how they run their NICU and to make them more breastfeeding friendly. They wouldn’t allow me to nurse my daughter for the first three days because she was in the NICU after the C-section and it would interrupt their visiting hour schedule. When my son was a premie in California I could visit him at any time including the middle of the night not just an hoit here or an hour there. Congratulations and thank you for being such an advocate for birthing mothers everywhere! What a monumental event that I have no doubt will help many families in the future.